Choo! Choo! Look who's two?! This Train Party was created for my little one's 2nd birthday. After selecting the theme, I considered having the event at different train stations, the zoo and some park venues. I was basically looking for anything with a train ride! I couldn't have been more pleased with having our party at Oaks Park, looking out over the Willamette River in Portland, Oregon. 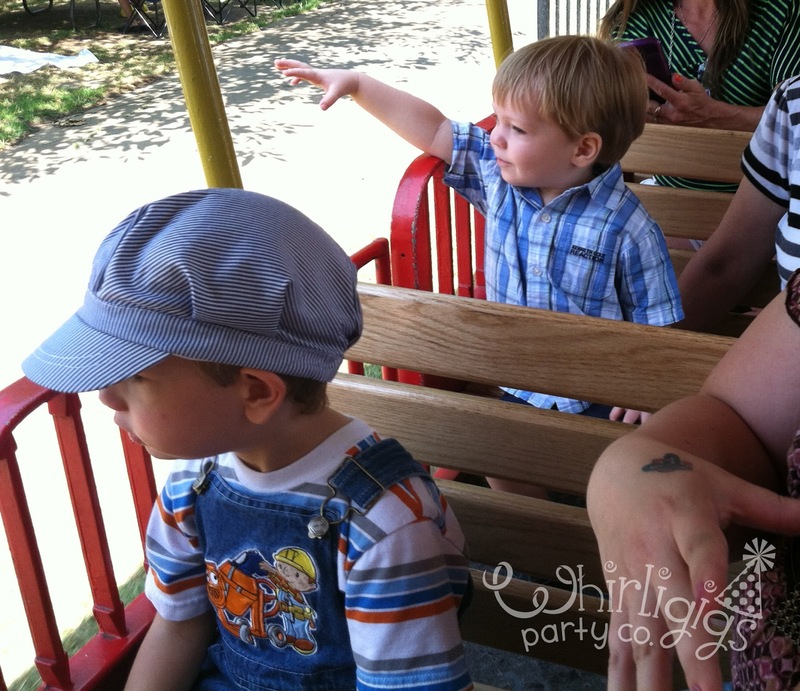 There was a train ride for the kids; it was very affordable with a free picnic area; and it just so happened that the tracks for the train ride run along where we set up, so the party guests and kiddos were thrilled to view the little train chugging by sporadically! 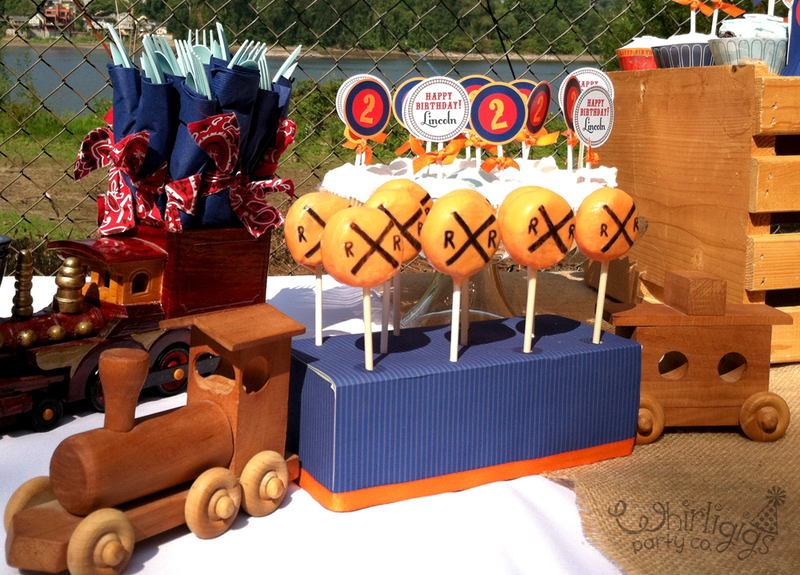 A Train Party theme is very exciting for toddlers and preschool age children who love trains! I was excited to find this wooden train centerpiece below, from Aero1 Toys on Etsy. It held the train-shaped fruit gummy snacks perfectly on our second guest table. It's also a fun toy for my son to keep after the party. 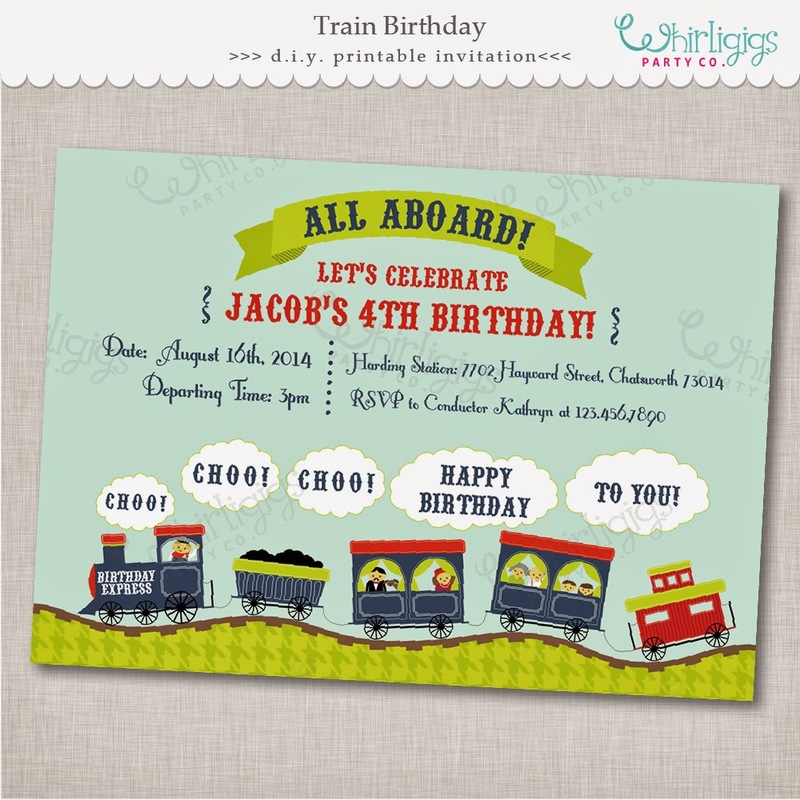 The Train Party Invitations feature a locomotive train running along the tracks choo-choooing a birthday message. It's also available in a pink / purple theme with a little girl engineer here. And a primary color red/yellow and blue theme here. 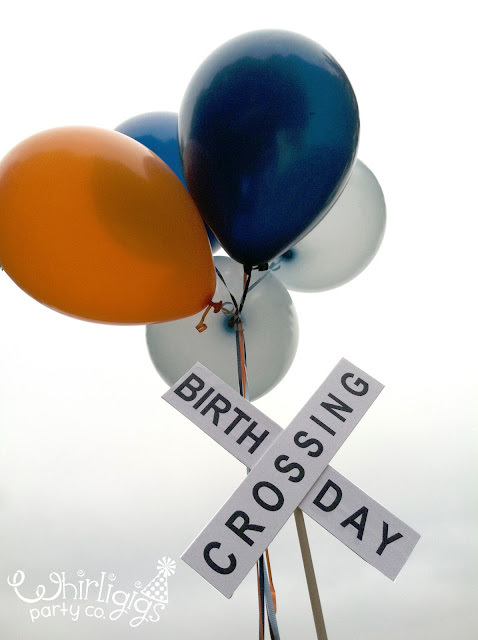 The printable Train Party Birthday comes with printable "birthday crossing" signs. I printed them on the heaviest paper my local printer had and glued to a 3/8" dowel to make these balloon centerpieces. I talked a little bit about how my mom has inspired my party business here, and she's always been an inspiration to celebrate what makes that child unique on their birthday. So having her in town for my son's birthday was a treat for us all. My son got to party with Grandma... Woot! Woot! And mom's creative and energetic companionship helping create and assemble the event, and in particular this DIY Train Centerpiece. It's made using recycled milk cartons, so it's durable and food-safe! We filled it with toddler friendly goodies: a fruit car (grapes), coal (black olives), railroad ties (pretzel sticks), and steam puffs (popcorn). 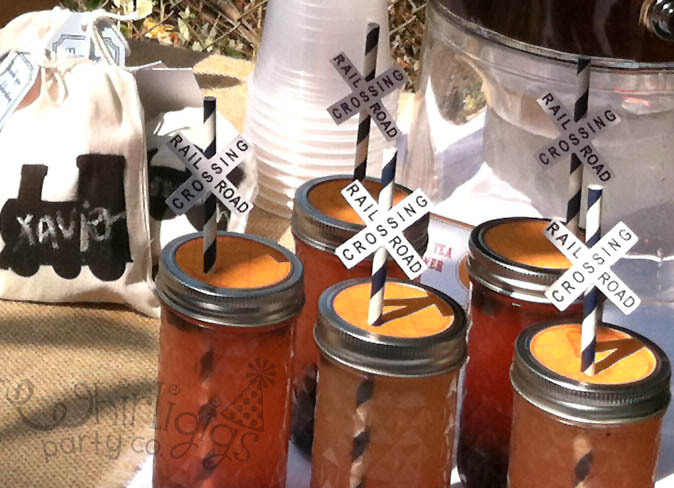 You can purchase the printable DIY Train Centerpiece, in 1 of 3 colors HERE. The DIY Party Plates we made were perfect for the kiddos train-shaped sandwiches (made with this). 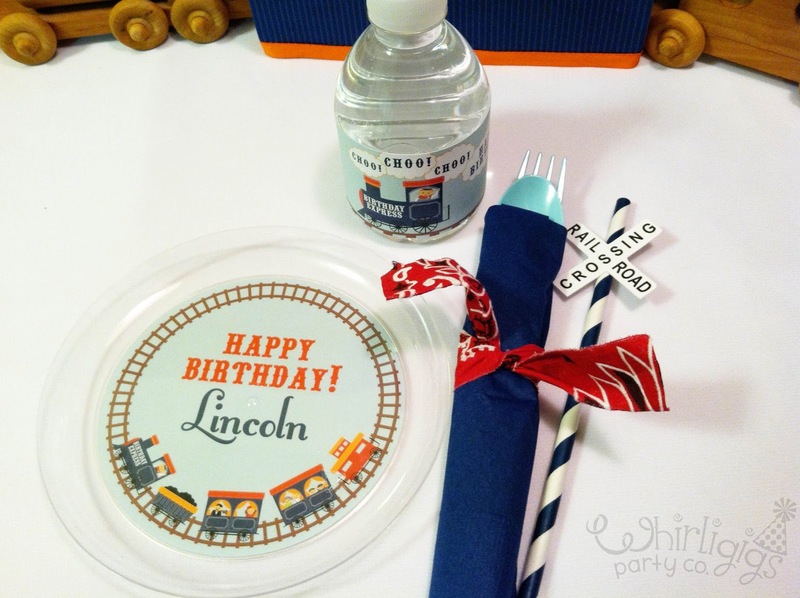 You can make your own using the 4" party circle from the Train Party and with this tutorial. We also added torn bandanna strips to colorful napkin bundles for extra train party fun! Fresh wild blackberries grow rampant around here this time of year. A sweet birthday treat for a mid summer birthday! Grandma, my kiddo and I picked some fresh before the event and made jars of refreshing and sweet blackberry lemonade. You can add a Railroad Crossing Straw for sipping fun! Here's my little birthday boy with some new train toys! Having a summer birthday is perfect for his sun-loving and adventurous spirit. 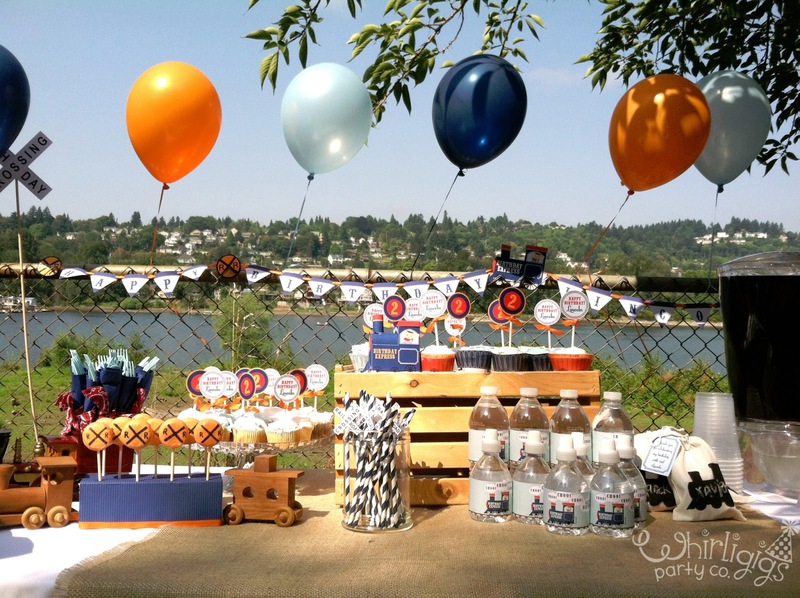 We loved to gather outdoors and celebrate him while letting the kids play and enjoy the event in a casual setting. 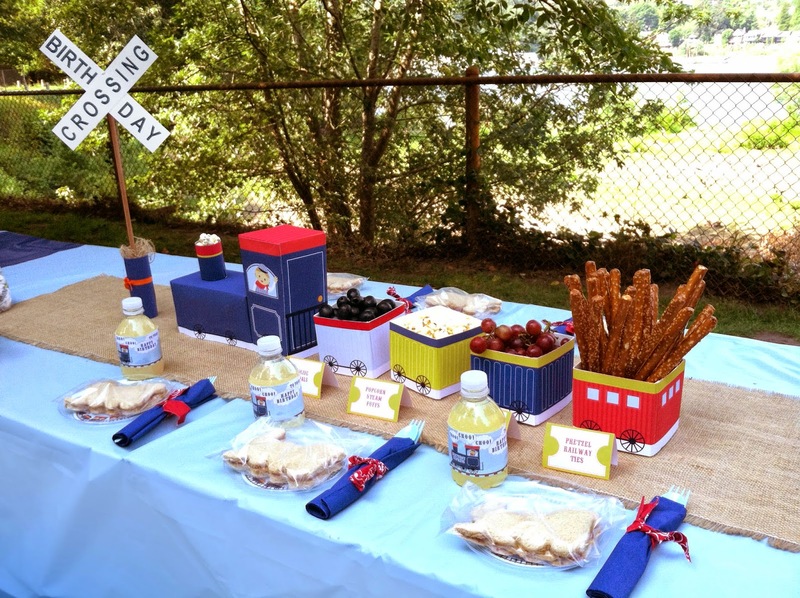 The picnic Train Party theme was a great choice for a second birthday! Creating Adorable Impressions for Life's Biggest Celebrations!